NASA’s Planetary Science missions to the outer planets help reveal secrets about the solar system by observing those outer distant worlds up close. Jupiter’s moon Europa and Saturn’s moon Enceladus are now thought to hide liquid water beneath their frozen surfaces and are high priority targets for NASA. Unlocking their secrets and those of the outer planets will help scientists understand more about planet Earth and the formation and evolution of the solar system. Jupiter has more mass than all other planets in the solar system combined. It helps protect Earth by steering comets either towards the sun or ejecting them to the outer reaches of the solar system or beyond. Jupiter has dozens of moons orbiting it, one of which, Europa, is thought to have a sub-surface liquid salt water ocean. It therefore may possibly harbor life as heat and water, the two ingredients required for life on Earth as we know it, are seemingly present below the moon’s surface. 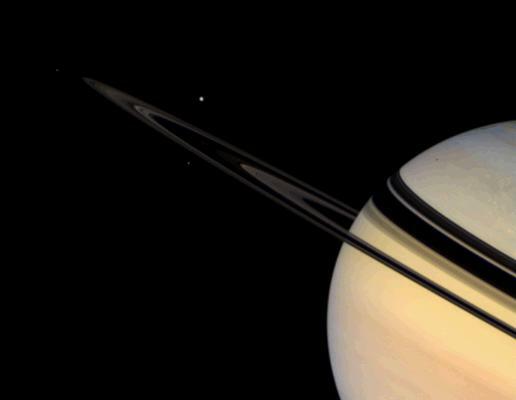 Saturn has intrigued man for centuries, especially since the invention of the telescope when the Saturn’s grand rings were observed for the first time. Much like Jupiter, Saturn has many dozens of moons, one of which, Enceladus, could provide a foot-hold for life to form. Observations by the Cassini spacecraft revealed Enceladus’ to have tenuous geyser and therefore heated liquid must be lurking below the surface. Water and energy are essential to all forms of life on Earth and these two constituents are what scientists treasure most in the search for life beyond our planet. Uranus - Over the 2006–2016 timeframe, there are no strategic missions planned to Uranus and only one spacecraft, the extremely productive Voyager II, has ever visited the distant planet. Ultimately, deep-entry probes into Uranus will be necessary in order to understand its composition and compare it to that of the other “water giant,” Neptune. 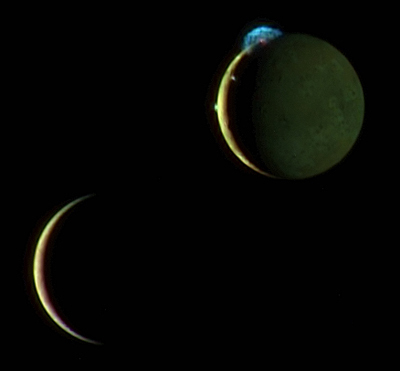 This beautiful image of the crescents of volcanic Io and more sedate Europa was snapped by New Horizons' color Multispectral Visual Imaging Camera (MVIC) at 10:34 UT on March 2, 2007, about two days after New Horizons made its closest approach to Jupiter. Neptune poses a number of important questions regarding how giant planets form and what truncates the formation of multiple giant planets in a planetary system. Residing on the edge of our planetary system, Neptune may hold, deep in its interior, chemical clues concerning the nature of the rocky and icy debris that formed the giant planets. A comprehensive study of Neptune, and its moon Triton, is considered a priority for the third decade by the Solar System Exploration roadmap team. Pluto was redefined in 2006 by the International Astronomical Union (IAU) as a “dwarf Planet.” Throughout the scientific community there is still much debate about this definition and many organizations have yet to weigh in. Pluto shares a region of its orbit with a collection of similar icy bodies called Kuiper Belt Objects (KBO’s). The Kuiper Belt is believed to represent the best available record of the original interstellar materials that formed the solar nebula. This region is also the birthplace of the short-period comets. Pluto’s orbit also crosses inside that of Neptune’s which renders Pluto a member of the Trans-Neptunian Object (TNO) class. Pluto’s moon, Charon, was discovered in 1978, but more recently in 2005, two moonlets, Nix and Hydra were revealed in telescopic surveys. The Pluto System is unique and the New Horizons mission will be the first spacecraft to glimpse these distant icy bodies when it encounters the system in 2015.